How Many Calories Does it Take to Digest a Carrot? Can You Eat Sweet Potatoes If You Have High Triglycerides? To promote good general health, the goal is to get your triglyceride (fats) levels below 150 milligrams per deciliter (mg/dL). Anything above this is considered high. And the higher they are, the greater your risk for heart disease. Modifying your diet and exercising can lower triglyceride levels. A triglyceride-reducing diet is low in sugar, fat and calories. Triglycerides are a form of fat that circulates through your blood. Eating a lot of fruits and vegetables is a good way to reduce triglycerides. You can eat sweet potatoes on this type of diet. A sweet potato is a root vegetable and a complex carbohydrate. It is a good source of vitamins A, E and B6. It is also high in fiber and has adequate potassium, iron, copper and manganese, according to World'sHealthiestFoods.com. This nutrient-rich food is a healthy choice for a person with high triglycerides. 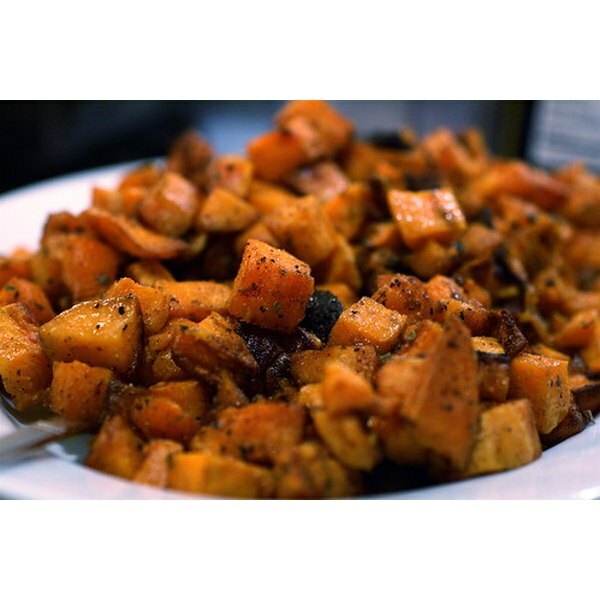 Yams are also a root vegetable that can be substituted for sweet potatoes. However, according to the American Dietetic Association, they are not the same. Yams contain more sugar and do not have as many vitamins as sweet potatoes. Eat more sweet potatoes than yams. According to the University of Washington's fact sheet on lowering triglycerides, a quarter-cup of sweet potato is the recommended serving size. Because it is a starchy food, be sure to control the portion size. A sweet potato baked in its own skin is a good preparation choice. You also can mash the potatoes and add a bit of salt or nutmeg and cinnamon. Avoid sweet potato recipes that call for the addition of extra sugar and fat. Limit your intake of candied sweet potatoes or sweet potato pie. Do Corn and Carrots Turn to Sugar After They Are Eaten?